Our Parma location, located off of Ridge Road, has remained our largest facility since it’s opening in 1969. 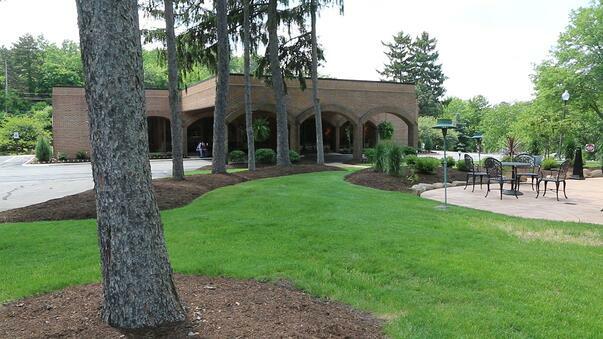 Our Parma location also houses our state-of-the-art crematory, which is surrounded by 17 acres of the beautiful West Creek Conservancy Preserve. We’re typically onsite seven days a week from 9 a.m. to 5 p.m., and we’re available 24/7 at 1-440-842-7800. For turn-by-turn directions, click "view larger map" on the right column of this page, then click "directions" and enter your address. Interested in visiting our updated facility? Schedule a tour to get to know our staff and find out if our Parma funeral home and crematory suits your needs. Ample on-site parking to accommodate groups of any size. A tranquil, relaxing outdoor garden that may be used for a variety of gatherings. Extensive updates throughout the facility with complimentary WiFi and integrated Sonos and TV system allowing families to personalize events with music, photos and videos. Dedicated rooms for catering and luncheon-style gatherings. A bistro lounge for family gatherings. On-site Remembrance Center, which provides a comfortable setting to choose from a comprehensive display of products. On-site crematory that guarantees your loved one will never leave our care. Dedicated members of the Busch staff who are ready to greet you and answer any questions. Families who choose our cremation cremation services can rest assured their loved one never leaves the care of our on-site crematory, backed by our 10-step Cremation with Confidence™ Guarantee. We invite you to visit our Parma funeral home to see the Busch difference for yourself. Contact us today for answers to any questions you have about the burial, cremation or preplanning process. Busch is Northeast Ohio’s preferred choice for cremation, burial and preplanning services.